​We’re seeing a renewed, comprehensive attack on National Forests in Alaska that seeks to turn over some of the most important fish and wildlife habitat on our public lands for development by special interests. The Tongass is the Nation’s largest national forest and supplies habitat for the fisheries and ample recreation opportunity of the region. Combined, fishing and tourism supply 26% of the jobs in Southeast Alaska, but these important industries are being cast aside for outdated and unsustainable old-growth logging that accounts for less than 1% of regional jobs and costs taxpayers millions in annual federal subsidies. Unfortunately, elected officials in the U.S. Congress and the State of Alaska continue to advance efforts to promote heavily-subsidized industrial uses of the Tongass or to privatize them through corporate giveaways and bad land swaps, ignoring impacts to sustainable industries that rely on intact habitat, beautiful scenery and wild places. The State of Alaska’s Roadless petition: The national Roadless Rule was created almost two decades ago to protect wild areas on federal lands that provide important fish habitat, drinking water, and recreational and business opportunities. In Alaska, -many of these areas have become critical to local economies and are essential to the fishing and tourism industries. This winter, the State petitioned the U.S. Department of Agriculture, which oversees the U.S. Forest Service, to exempt the Tongass from the Rule in a move that would enable highly-controversial logging and road building, prop up an outdated and highly-subsidized old-growth logging industry, and turn back the clock on years of successful collaboration in the region. We expect the State and U.S. Forest Service to move forward with rulemaking on this petition any day now. Sen. Murkowski (R-AK) riders: Alaska’s senior senator has repeatedly introduced riders to exempt the state from the Roadless Rule and to repeal the 2016 Tongass forest plan, which added protections for high-value habitat areas while enabling a sustainable forest products industry based on a 16-year transition away from old growth logging. More than 270,000 public comments were received in favor of the Tongass Plan amendment and 7,233 Alaskans voiced support for increased protections for important fish and wildlife habitat in the creation of the Tongass forest plan. Most recently, Sen. Murkowski has introduced riders to exempt Alaska from the Roadless Rule in the FY19 appropriations bill. Rep. Young (R-AK) riders: Alaska’s sole House representative passed a rider through that chamber to exempt Alaska from the Roadless Rule in the Farm Bill, and introduced a similar rider to the FY19 appropriations bill, though that was ruled out of order as of July 17. Alaska Native Claims Settlement Act (S. 1481, 1483, 1484 and 1491) These bills would create brand new for-profit ANCSA corporations, increase the corporate land cap, expand corporate selection power, remove important federal protections for fish and wildlife, block public access, grant unwarranted subsurface rights, and privatize valuable public infrastructure (roads, log transfer facilities, docks, etc.). Alaska Native Allotment Act (S. 785 and 1481) Allows an estimated 2,800 individuals or their heirs to select and receive two parcels totaling 160 acres, each, from across federal land in Alaska including within designated wilderness areas. This would create a patchwork of 5,600 inholdings totaling 448,000 acres where the most valuable and important places in Alaska are private and closed to public access. These efforts are a coordinated attempt to carve off large tracts of Alaska’s most important public lands, and in so doing, jeopardizes lucrative industries and recreation opportunity in Southeast Alaska. Kuiu Island (pronounced “Q-you”) is the 15th largest island in the U.S. and sits in the heart of the Tongass National Forest. The island provides world-class habitat for bears, eagles, salmon, trout, deer, and numerous other species of wildlife, fish, and fowl. Yet, through the years, Kuiu has been subjected to numerous and massive clear-cut timber sales by the Forest Service that have severely compromised the old growth hemlock, spruce and cedar forests upon which these species depend. Kuiu was heavily logged in the 80s and 90s, and now those clear-cuts are covered in dense second-growth forest that provides little utility to fish and wildlife. The importance of the remaining old-growth stands cannot be overstated. In the last decade, the Forest Service has consistently targeted this island for old-growth timber sales. Despite the expenditure of millions of taxpayer dollars on infrastructure and preparation for these sales, and minimum bid requirements that offer to sell the trees for pennies on the dollar, so far there have been no buyers. 2007-2008: The Forest Service completes its environmental analysis and puts Kuiu timber on the market. Nobody buys. 2014: The Sealaska Lands Bill gives Sealaska a large chunk of land on Kuiu Island adjacent to the Forest Service’s sale site. 2016: The Forest Service re-offers the sale and ups the ante by bending its own rules to allow full export of the timber - meaning whoever buys the timber won’t have to process the timber in-state. Nobody buys. 2017: The Forest Service spends more than $3 million of taxpayer money building logging roads on Kuiu Island in attempt to make the timber sale more appealing. May 5, 2018: The Forest Service offers the Kuiu sale, again, over objections from local users with no new environmental analysis and no consideration for increased use by outfitters, guides, hunters and anglers. Currently this timber sale is the focus of a lawsuit over how timber sales are administered and the lack of adequate environmental review. Because past logging on Kuiu Island targeted the largest, most profitable trees, cutting them down at an unsustainable pace, the Island simply doesn’t have any more old-growth forest to give and timber operators can’t make new timber sales there pencil out. If we’re just talking dollars, the annual $1 billion visitor industry and $1 billion commercial and sport salmon fishing industry, both of which directly rely on high quality wildlife and salmon habitat, are a much better bet. It’s time we give Kuiu a break! Umpqua for Tongass - Live Online Auction! What do Mike Mercer, Charlie Craven, Landon Mayer, Pat Dorsey, John Barr, Tim Drummond, Bob Reece, Barry& Cathy Beck, Craig Mathews and Andrew Grillos have in common? They're all Tying for the Tongass. You're invited to particpate in the Umpqua Tongass Initiative by taking part in a virtual month-long auction via the Handbid App and website! Downlaod the Handbid App onto your mobile device or visit the Handbid website, via the link below. Search “Umpqua,” and enter our auction, the Umpqua Tongass Initiative. You may browse the auction items without entering, but if you would like to bid, you must register and enter a credit card number. To celebrate Umpqua’s 45th Birthday in 2017, Umpqua has promised a donation of $45,000 to preservation efforts in the Tongass National Forest. 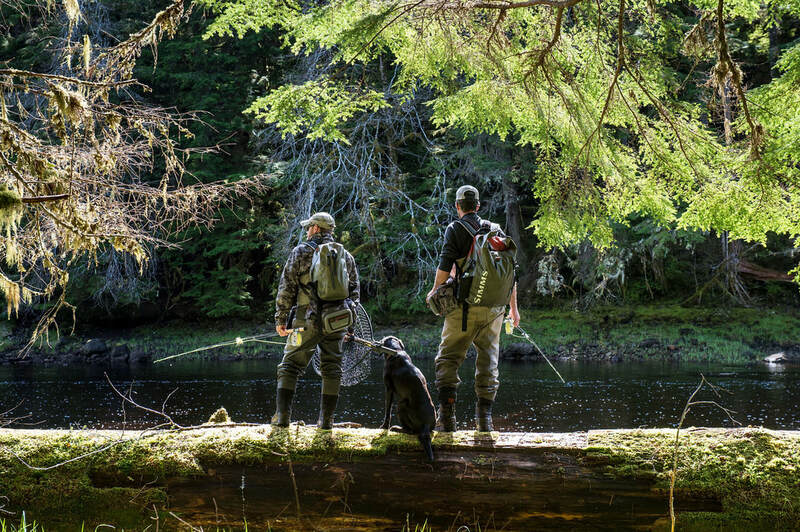 In partnership with Sportsman’s Alliance for Alaska, Trout Unlimited and the American Salmon Forest Coalition, the money will be spent on education and awareness programs as well as spawning and rearing habitat preservation in the Tongass. For their last fundraising push, Umpqua is hosting a month long virtual auction on the HandBid app with the title “Tied for Tongass.” The auction includes Umpqua items, YETI coolers, Scientific Angler gear and the main event: Original hand tied patterns from Umpqua Signature Tyers. Join in and help save the Tongass! On February 7th the Senate Public Lands Subcommittee had a hearing on a series of bills, one of which stands to give away 620,000 acres of public lands. This is the first of a four-part blog series drilling down into the details of the so-called “Alaska Native Claims Settlement Improvement Act” S. 1481. Email Senator Murkowski and Senator Sullivan to let them know you support keeping public lands public. Can you imagine if 5,600 in-holdings at many of the most prized and beloved locations around Alaska all the sudden became private and off-limits to public access across the state? Imagine “NO TRESSPASSING” signs within the heart of the world-famous Kenai Wildlife Refuge, on salmon-rich Prince of Wales Island, along famous steelhead rivers like the Situk, or even portions of the Arctic National Wildlife Refuge. This nightmare could become a reality under a new bill promoted by Senator Murkowski and Senator Sullivan, called the “Alaska Native Veterans Allotments Act” (S. 785/S.1481). Originally passed in 1906, the Alaska Native Allotment Act allowed qualifying Alaska Native individuals to select and receive 160 acres each from federal lands in Alaska. This program sunset when Congress passed ANCSA in 1971. Congress re-opened the program in 1998 for an 18-month period, and is looking to do so again for the third time. Read more about why privatizing public lands is bad for fish. We support Alaska Natives and our veterans. But when you dig down into this bill, it becomes clear that this bill isn’t really about addressing inequity; it’s a land grab. This bill is far too broad in scope, not only expanding the number of people who could qualify, but also expanding the kinds of lands that could be selected. This bill would remove important protections for fish and wildlife, and the land included could be logged, mined, developed or otherwise exploited for short-term gain, without concern for long-term consequences. Allows an estimated 2,800 individuals, or their heirs, to select and receive two parcels, adding up to 160 acres, each. That’s a patchwork of 5,600 inholdings totaling 448,000 acres in some of Alaska’s most valuable and important public lands. Allows selections from any vacant federal land in Alaska outside of the TransAlaska Pipeline, National Parks, National Preserves, or National Monuments. Meaning land could be selected from Wilderness areas, wildlife refuges, and numerous other important areas. Portions of the Kenai River, Prince of Wales Island, and the Situk River, among other places, could become off limits. Removes the requirement that an individual must have a historical connection to the land they receive as an allotment. Meaning that instead of returning historical, traditional, and culturally-important land, this bill allows individuals to select land based on how resource-rich and valuable the land is – immediately providing incentive to sell the land off or exploit it for profit. Instead of giving away our public lands and making the places we love off-limits in a broad-brush attempt to liquidate our public lands, we should seek a more focused approach. We can find more creative ways to appropriately compensate individuals unjustly left out of Alaska’s century-old Allotment system, while still honoring and protecting the cultural and traditional ties of Alaska Natives to the land AND keeping our public lands public and important salmon protections in place. Public lands are owned by all of us and these lands are managed for the benefit of all. History has shown that when public lands are privatized, they're exploited for short-term economic profit at the expense of our fish and wildlife, and our lucrative and sustainable fishing, hunting and tourism industries.